The 2006 Centennial Awards Banquet, the Society's 22nd annual celebration of corporate success stories in the Prairie State, was by many accounts one of the best ever. More than 140 guests gathered in the Empire Room at Chicago's Palmer House Hilton hotel to toast the anniversaries of some of the state's oldest businesses and not-for-profit organizations, including the Chicago Cubs (1876), the Lincoln Park Zoo (1868), the Chicago History Museum (1856), the State Journal-Register (1831), Oak Ridge Cemetery (1856), the Edwardsville Public Library (1819), the Chicago Illini Club (1876), and more than a dozen others. In addition to the Centennial Awards, the Society bestowed special honors to Apollo 13 astronaut Captain Jim Lovell (Lifetime Achievement), WGN-Radio's Milt Rosenberg (Jack Brickhouse Award for Broadcast Media Excellence), and the Green Mill Cocktail Lounge (Artistic Achievement). The Society was honored to have Secretary of State Jesse White in the audience, who accepted an award for the Chicago Cubs, and, as state librarian, gave an award to the Edwardsville Public Library, the oldest public library in the state. The evening opened with a reception sponsored by the Illinois Chamber of Commerce. Early in the evening Chamber president and CEO Doug Whitley took the podium to congratulate the Centennial Awardees on their achievements, as did Centennial Awards Committee chairman Norman Berger and ISHS president Marvin W. Ehlers. Once again, Pat Brickhouse and Jack Taylor introduced each of the Centennial businesses and their representatives, who received a plaque inscribed by Illinois governor Rod Blagojevich and President Ehlers. Following the distribution of the awards, banquet guests were entertained by jazz vocalist Nancy Taylor, courtesy of the Green Mill Cocktail Lounge, the oldest jazz club in the nation. All in all, it was an unforgettable evening. The immigrant population at the turn of the 20th century in Chicago often lived in overcrowded and meager living conditions— prime breeding grounds for tuberculosis. In response, the Chicago Tuberculosis Institute was founded in 1906 to combat this disease and care for its victims. The Institute expanded its services to cover all of Cook County in 1938 and enlarged its scope to include all lung disease in the 1950s. Renamed the American Lung Association of Metropolitan Chicago in 1993, the organization's mission is to prevent lung disease and promote lung health through research, advocacy, and education. Mr. and Mrs. Frank Becvar accept the Centennial Award for Becvar & Son Funeral Home of Crestwood. Becvar and Son Funeral Home, Inc. The Becvar Funeral Home had its beginnings in 1906, when owner Frank M. Becvar was licensed as an embalmer by the state of Illinois. He opened his first storefront on 47th Street in Chicago, and moved his business to Kedzie Avenue in 1923, an area known as Chicago Lawn near the headquarters of the Grand Trunk Railroad. In 1927, Frank Becvar opened one of the first funeral chapels on the Southwest Side. When he died in 1935 his widow, Mary, and their four sons took over the business. Soon the third generation of Becvars became involved. In 1984, grandson Frank V. Becvar moved the business down the street. After his son, David, graduated from embalming school in 1996, the company expanded and moved to its present location in Crestwood. Secretary of State Jesse White, who played minor league baseball with the Chicago Cubs organization in the 1950s, accepts an award for the 130-year-old Cubs franchise. In 1876, the Chicago White Stockings became one of eight charter members of the National League. A.G. Spalding managed the team in the first game in the history of the Chicago National League Ball Club, which took place on April 25. Spalding doubled as the pitcher and recorded the first NL shutout, a 4-0 win over Louisville. The White Stockings went on to win the inaugural National League championship. The team played in five different locations in the 1800s before moving to Wrigley Field in 1914. The fledgling league thrived, as did the Chicago organization, becoming one of the sport's first dynasties, winning six of the first 11 titles. Win or lose, the Chicago Cubs have made Illinois one of the premiere baseball capitals of the world. The Chicago History Museum is the city's oldest cultural institution. Founded in 1856 and incorporated the following year by an act of the state legislature, the former Chicago Historical Society opened its first facility at the corner of Dearborn and Ontario streets. The building and most of the collection burned in the Great Fire of 1871. The Museum occupied temporary buildings on the same site until 1896, when it built a massive stone edifice designed by Henry Ives Cobbs. The Museum collects, exhibits, and interprets documents, images, and artifacts related to U.S. history and metropolitan Chicago. Its three-fold mission is to expand audiences for history, be a leader in history education, and be a premier research institution. On April 26 1878, The Illinois Club of the City of Chicago filed for formal recognition with the Illinois Secretary of State. Its purpose—then and now to provide a source of continuing relationship for graduates with their alma mater, and it seeks to promote the best interests of the University in the Chicago area. All aspects of university life provide themes for Illini Club programs: athletics, scientific research, student life, and administration. Members are alumni of the U of I who meet several times a year to support athletic events, promote university activities, and fund-raise for scholarships. One of the oldest communities in the state, Edwardsville had a public library as early as 1819. The women of Edwardsville maintained this first collection until the library was re-chartered in 1879. A new library building, constructed on land donated by the city and financed by a $12,500 gift from philanthropist Andrew Carnegie, opened its doors in 1906. A fire in 1956 destroyed the collection but the building was saved. With the help of the community and the Edwardsville library's friends, the library reopened in 1957. Stones from the same quarry as the original building were used to construct the new facility, blending new with the old. The library sees itself as community heart as a library. Education as the first key to equality for women was and remains the foundation of the Friends in Council. Founded on July 28, 1880 in Princeton, the Council's built its mission around helping women educate themselves, an innovative idea in a time when opportunities and resources for women were scarce. For 126 years, members of the Friends in Council have researched and presented programs on a variety of topics—literature, history, science, philosophy, current events, and the arts. The goal was to leave a legacy of learning for women who would follow in their footsteps. Through political, social, economic, technological, and psychological changes The Council has stayed true to its mission. In 1857, Governor William H. Bissell signed a bill to create the first school to train teachers in Illinois. Jesse Fell, founder of the Bloomington Observer, raised $141,000 to secure Normal as the site, and then-attorney Abraham Lincoln drew up the bond agreement, making Illinois State Normal University the first public institution of higher learning in Illinois. The first commencement was in 1860, and 10 graduates walked down the aisle. During the Altgeld administration, the Normal School system expanded, creating additional teaching schools in DeKalb and Charleston. In 1964 Illinois State University became a multipurpose institution. With a more liberal arts focus, it now has an enrollment of more than 20,000. The world-renowned Lincoln Park Zoo in Chicago was established in 1868. It began with the donation of two pairs of swans from Central Park. The original zoo collected animals through donation and by acquisition, and purchased its first species—a single bear cub—for $10 dollars in 1874. The zoo acquired more exotic animals from the Barnum and Bailey Circus in the late 1880s. Today, the Lincoln Park Zoo works not only to educate but to conserve our world's vanishing wildlife. Lincoln Park Zoologists assist in researching and protecting endangered species both locally and abroad, monitoring animal disease and promoting animal health. Recently the zoo has added a number of new exhibits, including the Regenstein Center for African Apes. Madia and Mirzet Dzubur receive the award for the Bosnian Muslim Benevolent Society of Illinois, founded in 1906. The early 20th century saw the arrival of many Bosnian Muslims to Chicago. Isolated by culture, language, and religion, the immigrants quickly learned to balance assimilation with the preservation of their culture and religion. The Bosnian Muslim Benevolent Society of Illinois was established in 1906. The organizers strove to serve their community. They helped to pay hospital bills; they helped make Muslim funeral arrangements. They also endeavored to preserve their religious and national customs and traditions to celebrate Muslim religious holidays. They sent substantial humanitarian aid to Bosnia and Herzegovina between 1992 and 1995. An ordinance to forbid burials inside Springfield city limits led to the founding Oak Ridge Cemetery in 1856. The official dedication, attended by Abraham and Mary Todd Lincoln, took place in 1860. Originally a 12-acre tract, the cemetery is now more than 300 acres located on Springfield's north side. Many local cemeteries were eventually relocated here. It is the home of the Lincoln Tomb, wherein are buried President Lincoln, his wife Mary, and their sons Edward, William, and Thomas. Oak Ridge Cemetery is the second most visited cemetery in the United States. In addition to Lincoln, it is also the burial place of several Illinois governors as well as the internationally known poet Vachel Lindsay. Rising Sun Lodge #115 of the Ancient Free and Accepted Masons received its charter on October 4, 1852, in Hainesville, Illinois, just 18 years after the first European settled in Lake County. One of its founders, Elijah M. Haines, served eight terms in the Illinois State Legislature and was also a prominent member of the Illinois Constitutional Convention of 1869-70. He also published the first history of Lake County. The original Lodge met in a building owned by Mr. Haines, which was destroyed by fire in April of 1879. Membership declined until the Lodge moved to nearby Grayslake in 1892, which gave it new life in a new community, where it thrives today. The Security Improvement and Loan Association opened its doors in Springfield in 1906 as a state chartered mutual thrift institution. Chartered to encourage community and individual savings, the Loan Association grew and merged through the years, taking the name Security Bank in 1995. Throughout these changes, Security Bank has remained committed to serving its customers. Every depositor at Security Bank is part owner and can help guide the bank into the next 100 years. Its motto—"Banking for Generations"—is more than a slogan. Security Bank encourages community involvement with such programs as "Women of Influence," an awards program for women who make significant contributions to the Springfield Community. Al Klairmont presents the Artistic Achievement Award to David Jemilo, owner of the Green Mill Cocktail Lounge, the oldest jazz club in the nation. Founded on November 10, 1831 as the Sangamo Journal, the 175-year-old State Journal-Register has defined "the news" in Springfield and central Illinois for generations. "The Journal paper was always my friend," wrote Abraham Lincoln in 1864. He was not exaggerating. Lincoln and Simeon Francis, the paper's publisher, were close friends and the Journal was a staunch defender of Republican party politics during the Civil War. Its chief competitor was the Illinois State Register, a paper with loyalties to the Democratic Party. Their rivalry ended in 1974 when both papers were acquired by the Copley Press and merged to form the State Journal-Register. With a circulation of more than 70,000, the S J-R is the newspaper of record for downstate Illinois. Founded in 1881 on one of the oldest industrial sites in northern Illinois, TC Industries Inc. became one of the nation's largest manufacturers of architectural terra cotta after World War I. George A. Berry Jr. purchased the enterprise in 1933, and kilns were added for heat-treating steel mill products, which quickly became the company's principal industry. The last architectural terra cotta was produced in 1966, and in 1972 the American Steel Treating Company, Processed Steel Company, and AMTEC Corporation became divisions of TC Industries. In 1985, TC Industries of Europe opened in Skinningrove, England, and TC Industries of Canada opened in Manitoba in 1998. Today the company is operated by the third generation of the George A. Berry family. In 1906 the "University Women's Club" began primarily as a social club. The members comprised a tea club that gathered one Tuesday a month and for special events. Their history is a well-documented look at how the events of the last century have affected women, academia, and society. Club activities and membership waxed and waned with the needs of the times. The members continue to promote friendship and education at UILJC, with more than just tea to nourish their ongoing activities. The Club now meets its mission by sponsoring smaller interest groups, scholarships, special events, and tours. The organization welcomes men and women who share the Illini heritage and spirit. 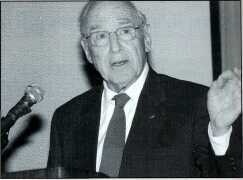 Captain James Lovell accepts the Society's Lifetime Achievement Award. 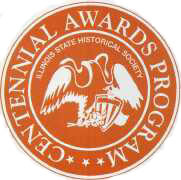 It is indeed an honor to be here tonight at the 2006 Centennial Awards Banquet and to be the recipient of the 2006 Lifetime Achievement award from the Illinois State Historical Society. I am humbled to be in the company of tonight's other honorees and the previous distinguished award recipients. The Illinois State Historical Society plays an important role in the preservation of Illinois history. It is vital that we all work with the Illinois Historical Society to preserve our history for future generations. This is the legacy we leave our children and grandchildren and it is imperative that it is documented and preserved. I am grateful that most of the historical moments I have been involved with were all captured on film. The importance capturing historical events is most evident during the first flight to the moon -Apollo 8. It was Christmas Eve, 1968. The moon was awe-inspiring and somewhat forbidden but it was the earth that held my attention. When I circled the moon and looked back at earth, my outlook on life and my view point of earth changed. By holding up my hand at arm's length, I could completely blot out our planet with my thumb; and I suddenly realized how insignificant we are. My impression of earth was one of an incredible beautiful blue and white ball, much like a Christmas tree ornament, hung in an absolutely black sky. You see the blue of the water and the white of the clouds. You don't see downtown Chicago or New York. You don't see boundaries or people. No whites or blacks or French or Greeks or Christians Jews or Muslims. The earth looks completely uninhabited, and yet you know that on spaceship earth there lives over 5 billion astronauts all seeking about the same things from life. From that view came a very famous photograph: "Earthrise". It has been in every conceivable publication I am sure you have all seen it. My last and final flight with NASA was Apollo 13; another historical flight that was also well documented. After three space flights, I had become quite comfortable with the idea of going into space. You would have thought that I would have had some apprehension flying on Apollo 13 taking off at 1313 - but it never really bothered me — at least not as much as it bothered my wife Marilyn. And then on April 13th the oxygen tank exploded! There were many hurdles to overcome — we were running out of electric power and water, we were slowly being poisoned by the buildup of carbon dioxide in the spacecraft and the temperature was dropping drastically. But in each case because of proper training, a dedicated ground control team and the previous lessons we learned we overcame the obstacles to finally bring the spacecraft back to earth safely. Our children will stand on a higher hill because of the mountains we had climbed. And the whole world benefits from their ready acceptance of it. If they can take our accomplishments as commonplace, then think of the new horizons that they can see beyond. From their view of history, their education and imagination will carry them to places that we wouldn't believe possible. To inspire young people to reach new heights, I have donated my space artifacts to the Adler Planetarium. It is fast becoming a premier space science center. Every generation has the obligation to free men's minds for a look at new worlds; to look out from a higher plateau than the last generation. Their vision is limited not by what their eye can see, but what their mind can imagine. To document the plateau that we stand on is the mission of the Illinois State Historical Society. From there future generations can gage their advancement. I deeply appreciate the honor you have bestowed upon me this evening. Italian immigrant Vincent Formusa was a jeweler and watchmaker by trade, but in 1898, the Chicago entrepreneur saw a golden opportunity. He began importing quality pastas, tomatoes, and olive oil from Italy and soon had the market cornered in his neighborhood. Founder of the well-known Marconi Brand Product line, Formusa brought two of his sons into the business and expanded the original storefront to a five-building complex. The company branched out and the now familiar "F" shield—signifying the Marconi trademark—is featured on antipasta and garnishes, salad dressings, and hot and mild giardinieras throughout Chicago and around the nation. Sales through the Internet have made the V. Formusa Company an international Illinois success story. Chartered in 1906, the Young Women's Christian Association's of Decatur and Macon County's first facility included a gym AND a tea room. To meet the needs of the young women of Macon County, the organization later expanded its facilities to run a low-cost cafeteria and to house transient rural workers commuting to work. Today the cafeteria and housing service are gone. The "Y"s ongoing mission is to eliminate racism and to empower women, offering new services to meet the changing needs of its community. Programs such as "Wear to Work,' among others, create opportunities for needy women to gain valuable resources and life skills to ensure and secure their future. Polly Poskin receives a Centennial Award for Oak Ridge Cemetery (founded in 1856). Jim Cunningham represented Illinois State University (1857) at the Centennial Awards Banquet. Chris Zrinksy helped Lincoln Park Zoo celebrate its 138th anniversary. Mary Ann Dunn accepts the award on behalf of Sectirity Bank of Springfield (1906). 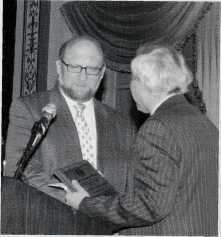 Chicago Illini Club president Louis Margaglione receives the Centennial Award. Mark Sorensen accepted the award on behalf of the YWCA of Decatur and Macon County. 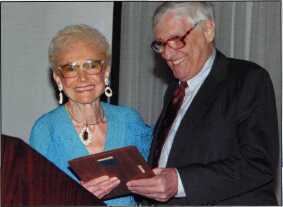 Vivian Larson, President of the Women's Club of the University of Illinois at Urbana-Champaign, takes home a plaque. Award winner Milt Rosenberg and Pat Brickhouse with WGN-Radio producer Bob Shomper and Diane Shomper.